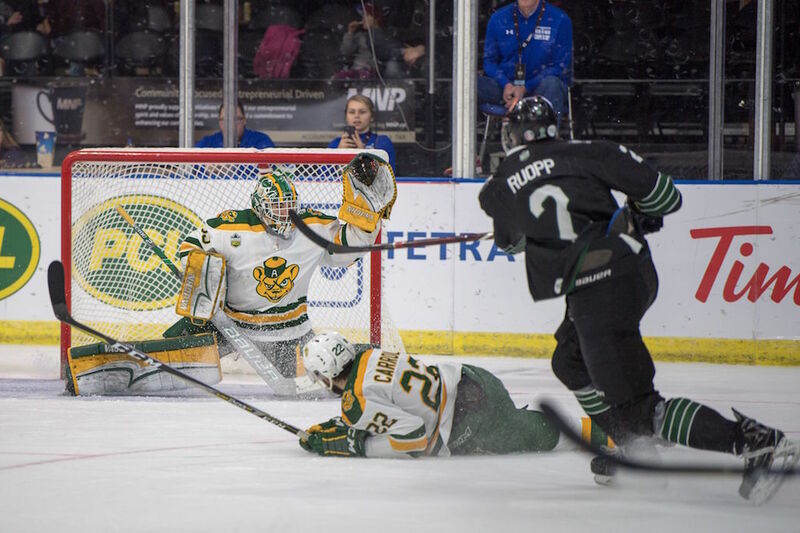 In a case of déjà vu, the Alberta Golden Bears shut out the Saskatchewan Huskies to earn a berth in the final of the 2019 U SPORTS Cavendish Farms University Cup. It was a renewal of an old rivalry at the ENMAX Centre on Saturday afternoon, as top-seeded Alberta faced Saskatchewan in the first semifinal game. 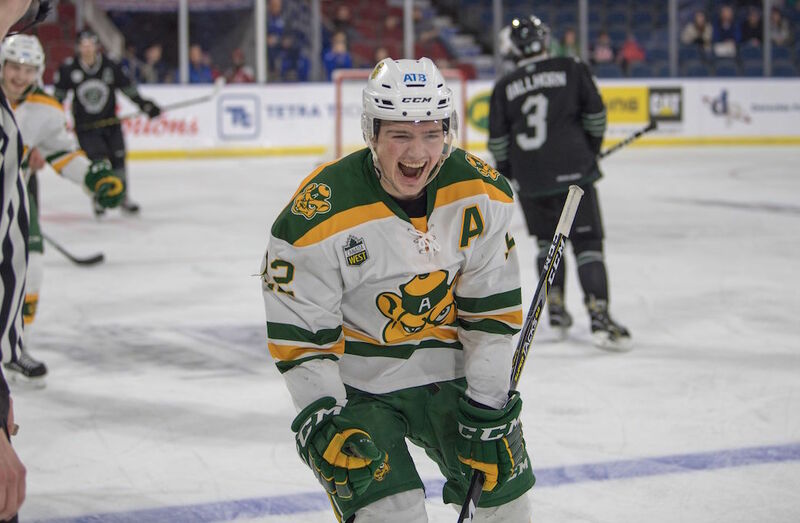 These foes were intimately familiar with each other having recently met in the Canada West championship that saw Alberta win the best-of-three series in the deciding game on the road. It was a similar result for Alberta, as they skated away with a 3-0 victory in this contest to secure their spot in the finals for a second consecutive year. Both goaltenders had their A game, but Alberta’s Zach Sawchenko out-dueled U SPORTS Goalie of the Year Taran Kozun, stopping all 43 shots he faced to record another clean sheet against Saskatchewan. Sawchenko praised the effort of his fellow Golden Bears in the shutout. “It’s a team game and this team’s bought in,” he said. Alberta controlled much of the play early in the first period, generating several scoring chances. However, Kozun showed why he was named the best netminder this season, coming up with several key saves to keep the game scoreless. As the first period progressed, the ice slowly started to tilt in favour of Saskatchewan. Spurred by a successful early penalty kill, Saskatchewan would find their legs and drive possession for much of the latter half of the period. Sawchenko stood tall and slammed the door shut on the Saskatchewan attack. The period would end in a scoreless draw. Alberta would start the second with a five minute power play. Saskatchewan second-year forward Carter Folk was assessed a checking from behind major, for a hit on Alberta’s Trevor Cox after the horn had sounded to end the first. Saskatchewan successfully killed off the extended power play with tight defensive play featuring several players blocking shots. The second period would end in similar fashion to the first, with the score knotted at zeroes. Alberta opened the scoring 1:38 into the final stanza on a shot by fifth-year and team captain, Riley Kieser. The Golden Bears forward flipped a loose puck on net that managed to find its way through traffic to the twine. “We ended up getting rewarded for all our hard work and getting bodies in front of the net,” Kieser said. Nine minutes later, Alberta would double their lead when U SPORTS Player of the Year Luke Philp scored his third goal of the tournament. Following a turnover behind the net by Kozun, first-year Alberta forward Grayson Pawlenchuk would slide a centreing pass to a wide-open Philp in the slot who fired the puck into the yawning cage. Alberta would seal the deal with an empty net goal. Pawlenchuk, the Canada West Rookie of the Year, intercepted a drop pass in the Saskatchewan zone and wristed it home to seal the victory. The Golden Bears outshot the Huskies 46-26. 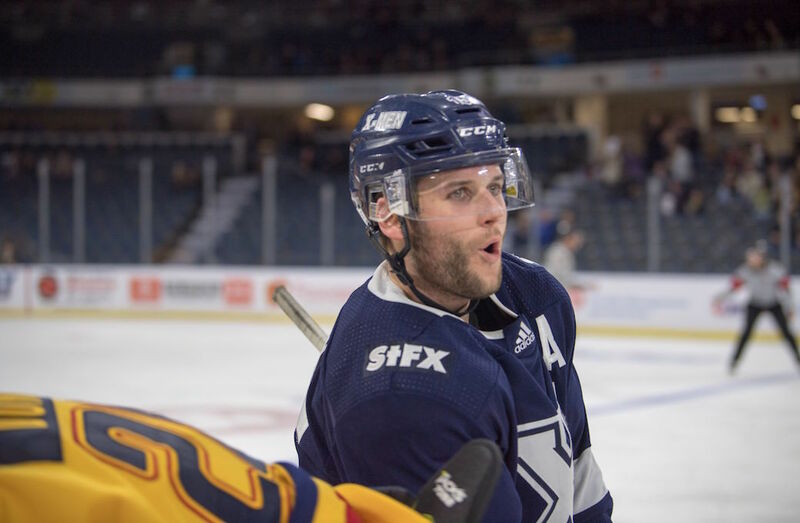 Alberta will once again play in the championship game against the winner of the second semifinal between the UNB Reds and StFX X-Men. Puck drop is set for 8:00 p.m. ET / 5:00 p.m. PT Sunday on Sportsnet 360 and Sportsnet Now. Saskatchewan will hit the ice in the bronze medal game at 3:00 p.m. ET/ 12:00 p.m. PT Sunday on USPORTS.LIVE.